This is my first installment of a series of web pages that are designed to show the application of math to the physiology of middle-distance and long-distance running. Since this is just a sample of what is to follow, I decided here to introduce you to probably the "most famous" of all running formulae....The Daniels/Gilbert Formula. I first saw it in a spiral-bound pamplet of "running prediction" tables several decades ago. The pamplet was titled, Oxygen Power, and was written by Jack Daniels and Jimmy Gilbert of the University of Arizona. I had ordered it from an offer that I found in a footnote of a Runner's World article, I believe around circa 1980. Daniels was a coach and pysiologist at the time of the pamplet's publication. Jimmy Gilbert was one of his runners. I have nicknamed their formula the "Drop Dead Formula" because it is the all-out intensity (as a percentage of one's maximum oxygen uptake capacity) that a person can run for a given amount of time1. That formula coupled with an "oxygen cost formula" [first published by Daniels in The Conditioning for Distance Running--the Scientific Aspects (John Wiley & Sons, New York, 1978)] was the basis for Daniels and Gilbert being able to generate a series of tables that predict a person's all-out best running time for a given distance. I have not seen the "drop dead" formula published any other time. Since that offer in Runner's World long ago, I don't think the tables were ever offered again either. 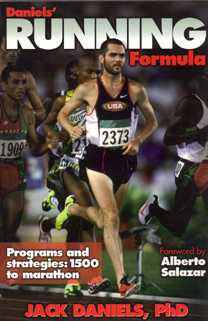 The old running book that had the oxygen cost formula is out of print but Amazon still has limited copies in stock. On a more modern note, some readers may own the book shown on the left. The book is entitled, Daniels' Running Formula. In Chapter Three, Jack Daniels explains the concept of "VDOT" that he and Gilbert used for their cross-reference to predicted race times at various distances, ranging from the 800 meters to the marathon. Don't be misled by the title of Daniels' book shown on the left. If you purchase it, don't expect to find his oxygen cost or "drop dead" formulae spelled out mathematically. He only gives you the tables generated from the formulae. Of course, I feel certain that Daniels was not intentionally trying to hide the math from the readers. It is just that the book targets runners and not scientists and mathematicians. His reference to "formula" in his book title refers to a non-mathematical definition. It is actually a very scientifically based tutorial on how to train properly in order to reach your racing goals. It is a careful mix of training intensities that maximizes your conditioning. I highly recommend his book for anyone wanting to race at their peak performance level. 1NOTE:Daniels and Gilbert came to their conclusions by examining the known maximum oxygen uptakes (VO2max) for world class and world recorder-holder middle-distance and long-distance athletes. They figured that these guys had "pushed themselves to the limits" for their respective competitive distances.